10 Weeks, 477 Beds for Kids in Foster Care! On November 14, 2018, FOUR semi-trucks filled with mattresses and box springs arrived at the warehouse of Arizona Helping Hands. These beds were donated by LIVING SPACES furniture stores. At a promotion held throughout the company’s multi-state chain of stores, LIVING SPACES pledged to donate one mattress set for a child in foster care for every customer who purchased a bed during the sales period. The result of this activity was that 477 boys and girls are sleeping on a beautiful REVIVE mattress tonight! Arizona Helping Hands is the state’s largest provider of basic needs to the most vulnerable children. Kids in foster care have been victims of abuse and neglect at the hands of irresponsible adults. Our primary objective is to provide these boys and girls with a bed to sleep on, to give them a Safe Place to Sleep. Our numbers continue to set new levels each and every year. In 2018, we provided 3,338 beds to kids who otherwise would be fighting over the sofa or left to snuggle up in a pile of blankets on the floor of Grandma’s house. 477 bed sets! When you include the box spring and the mattress, the total is 954 pieces of bedding. You might think that this gift would take an awfully long time to distribute – but that’s not the case at Arizona Helping Hands. We have already gone through the entire donation. In just 70-days’ time every mattress has been loaded onto pickup trucks, vans, rental trucks and even tied onto roofs of cars to travel home and give comfort and safety to boys and girls. We wish there weren’t so many children in need of our support. We wish that the opioid epidemic didn’t exist, and that wrongful actions of adults didn’t impact the lives of innocent children. We wish there weren’t so many children in need of our support. We wish that the opioid epidemic didn’t exist, and that wrongful actions of adults didn’t impact the lives of innocent children. But wishing won’t make it so – there is much work to be done. Our goal is to provide basic needs to children in foster care throughout the State of Arizona. Families arrive at our warehouse door every day of the week seeking a bit of help, and we are here to lend our helping hands. From beds and cribs, to clothing, diapers, personal care items and even birthday gifts, our mission is to be there to help these children. We are so grateful to businesses and individuals who understand the importance of sharing your blessings with those who aren’t as fortunate. These kids don’t deserve the hand they’ve been dealt. Companies like LIVING SPACES see the importance of stepping up and working together to make our world a better place. 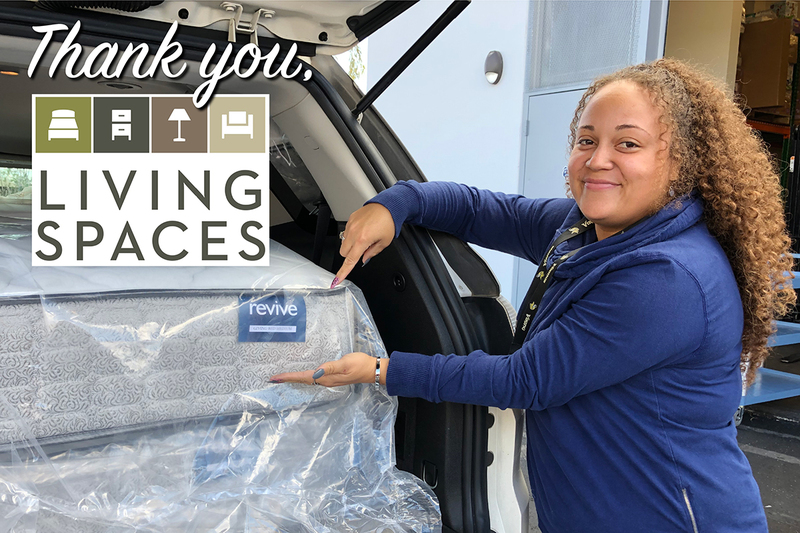 The team from REVIVE, and the customers who supported this drive should take great pride in knowing that due to their efforts, 477 boys and girls in foster care are sleeping comfortably tonight on a beautiful REVIVE by LIVING SPACES mattress. Sleep well and sweet dreams! We all have the power to make a difference for kids in foster care. Will you lend your Helping Hands to make the road a bit easier? You can volunteer your time, dedicate your talent and use your treasure to assist. Visit www.azhelpinghands.org to learn more. Put your tax dollars to work through the Arizona Foster Care tax credit at no cost to you at www.azfostertaxcredit.org. PICTURED: Foster mom Kristina received 2 placements. Arizona Helping Hands filled the van with REVIVE twin bed sets.